Do Christmas trees qualify as topiary? We never think of them as such but they fit the definition — the Oxford dictionary calls topiary the “art or practice of clipping shrubs or trees into ornamental shapes.” And surely Christmas trees don’t grow naturally into the perfect cones commonly seen but have been pruned and clipped to shape them. 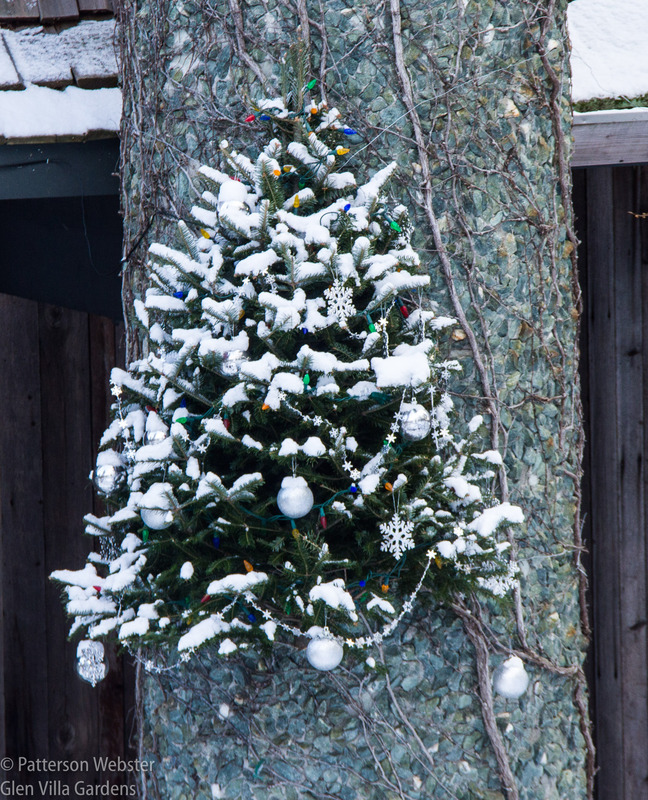 This cone-shaped spruce tree is attached to the chimney stack at Glen Villa. It hangs right outside our front door. As a young gardener, I disliked topiary, thinking that it was a distortion of nature and consequently something that should be looked down upon, if not outlawed completely. But with time I’ve come to realize that all gardening distorts nature in one way or another, confining plants to borders and beds and combining them in ways never found in the wild. I’ve also come to realize that topiary can be fun. Reviewing photos from my most recent trip to England, I offer these examples. 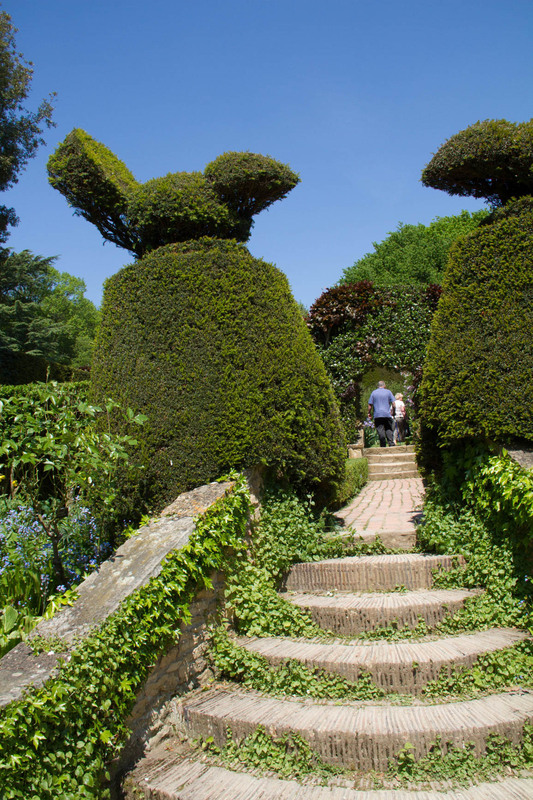 At Rockcliffe, Emmas and Simon Keswick’s garden in the Cotswolds, the path up to a dovecote is lined with over-sized doves. Each bird is slightly different, and each has its own personality. Note as well the corkscrew trees beside the gate. 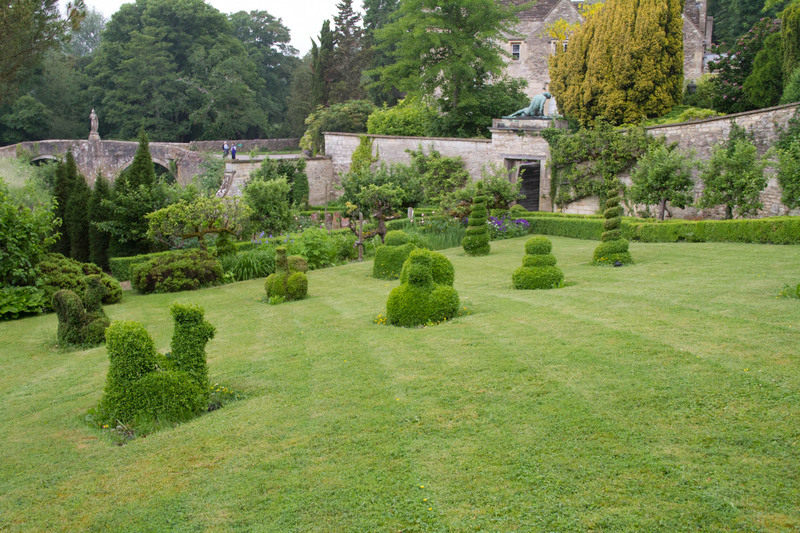 At Haseley Court, a garden originally designed by Nancy Lancaster and now the home of Fiona and Desmond Heyward, a topiary chess board covers a flat piece of lawn. 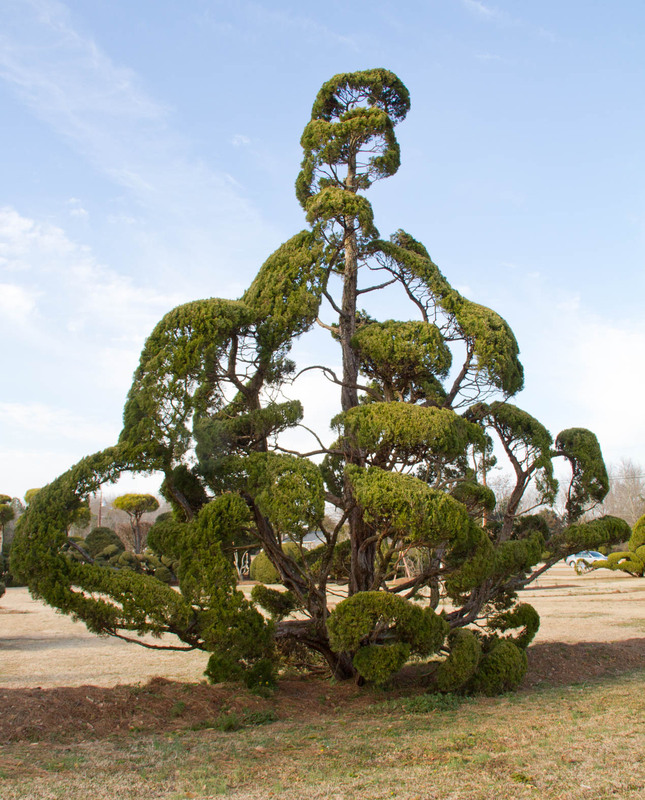 This topiary was maintained during World War II by a local gardener who cycled over from the nearby village to prune his ‘kings and queens,’ as he called them. 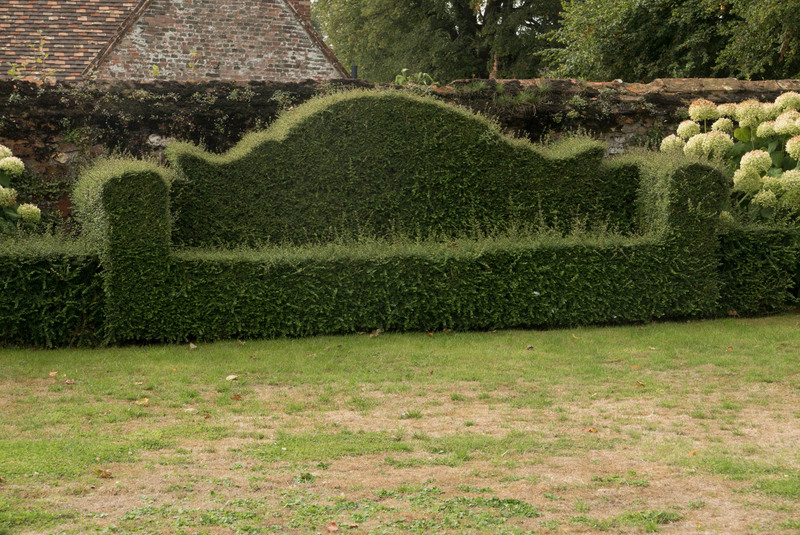 At The Old Rectory at Castle Rising, a topiary couch offers a place to sit and watch a tennis game. The sofa is not necessarily comfortable but it does invite you sit down. 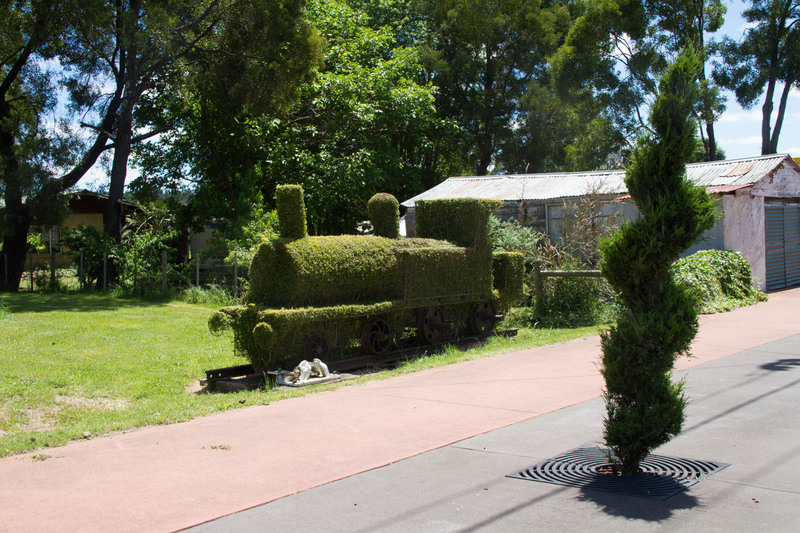 England isn’t the only place where topiary can be found. 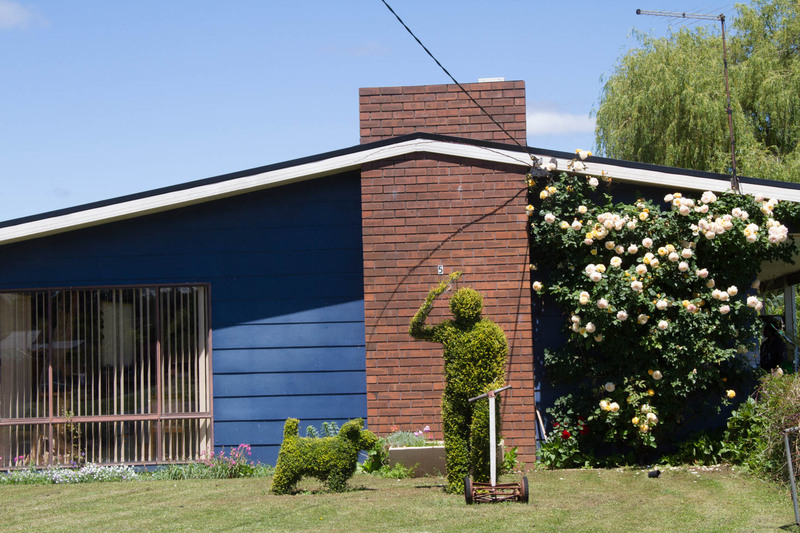 In Railton, a small town in Tasmania, topiary features in many gardens. Talk about green men! Is this guy about to throw something for the dog to catch or is he waving to passers-by? Not surprisingly, a train is featured along Railton’s main street. The wiggly tree rising up from the tree grate is topiary of another kind. And since this is Australia, there is a kangaroo. An odd looking beast but clearly meant to be a kangaroo. The pouch may not be visible but the sunglasses are. 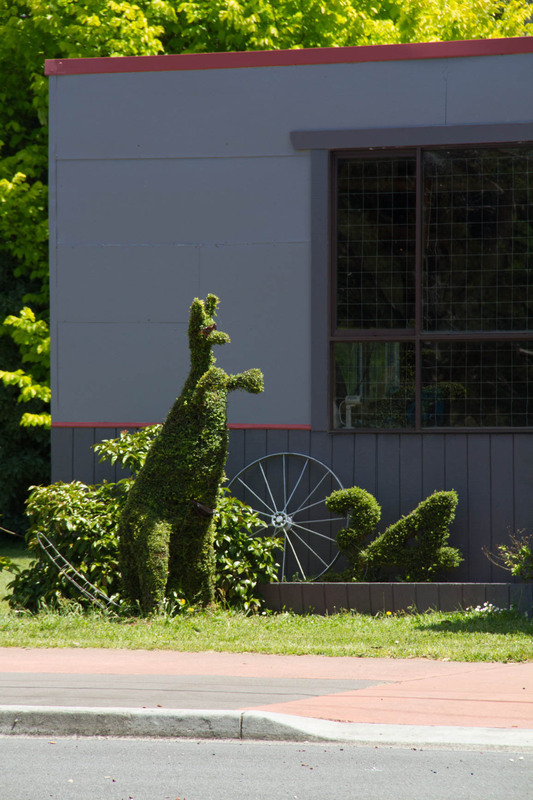 Animals often feature in topiary. 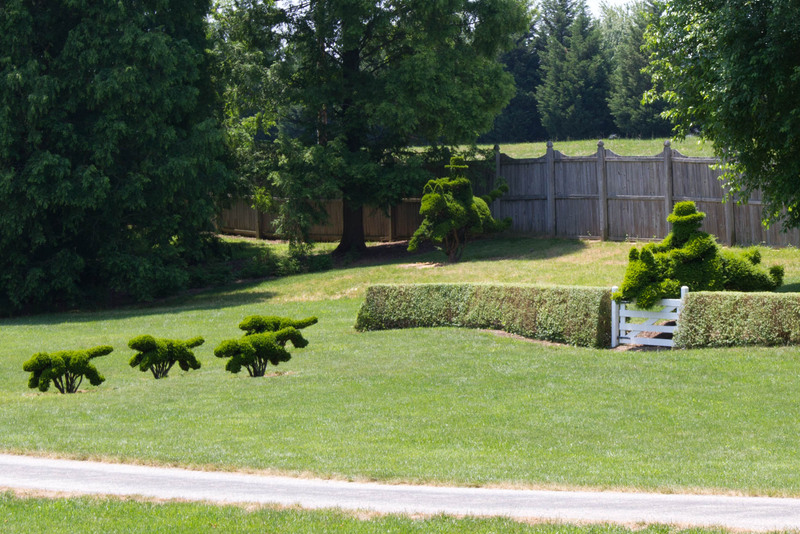 The American garden which is tops for topiary is the Ladew Topiary Garden in Monkton, Maryland, where 100 topiary creations decorate the garden’s 22 acres. Harvey Ladew, the man who created Ladew’s topiaries, was an anglophile who rode to hounds. When he saw a topiary of hounds chasing a fox atop an English hedge, he decided to go one better, adding two riders and their horses. The fox, not shown here, was looking a bit tired when I saw him a few years ago. 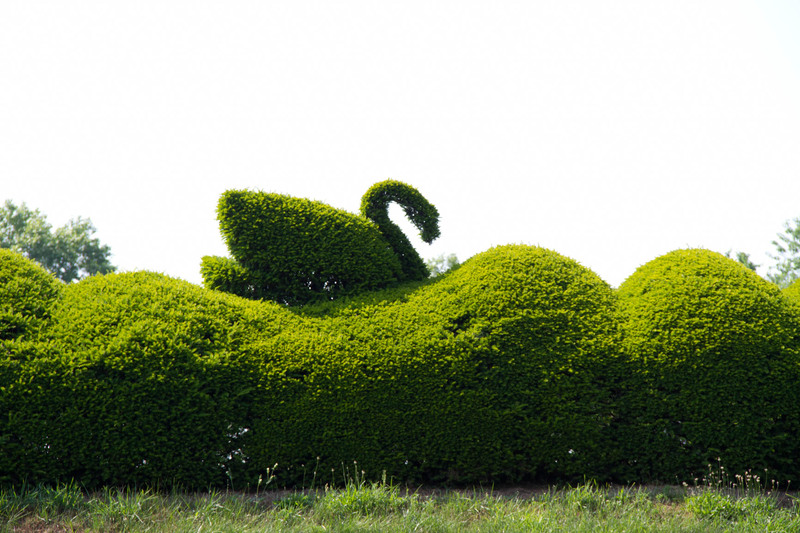 Also at Ladew is an enormous swan, swimming happily along the top of a wavy hedge. Consider the time that went into shaping this fine piece of topiary, and the skill that was needed to do it. Impressive! And at Iford Manor, near Bath, hens and chicks parade across a lawn along with squirrels and other animals I don’t remember. This area includes a sofa and table with tea pot. Very English and unaccountably amusing. 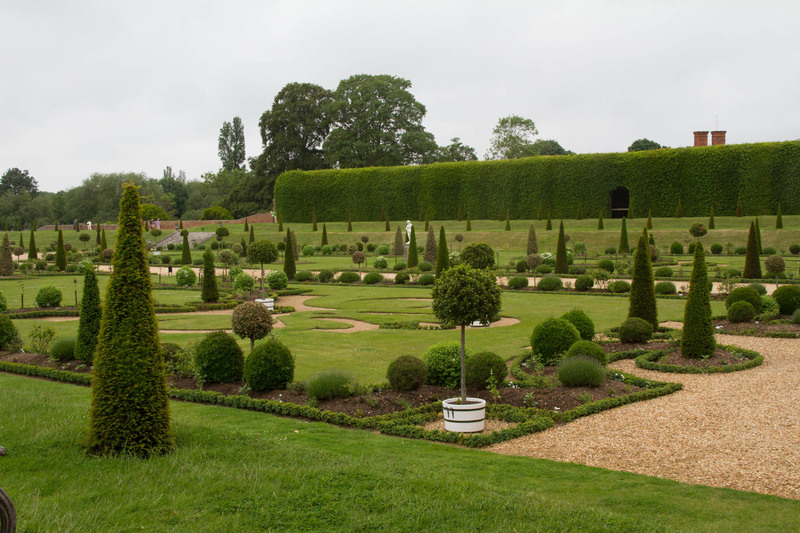 Topiary dates back to the first century or even earlier and became very fashionable in England in the late 17th century. Sir Francis Bacon, one of the influential writers and critics of the period, didn’t like it much. The 17th century-style garden at Hampton Court Palace features cones, balls and other geometric shapes. 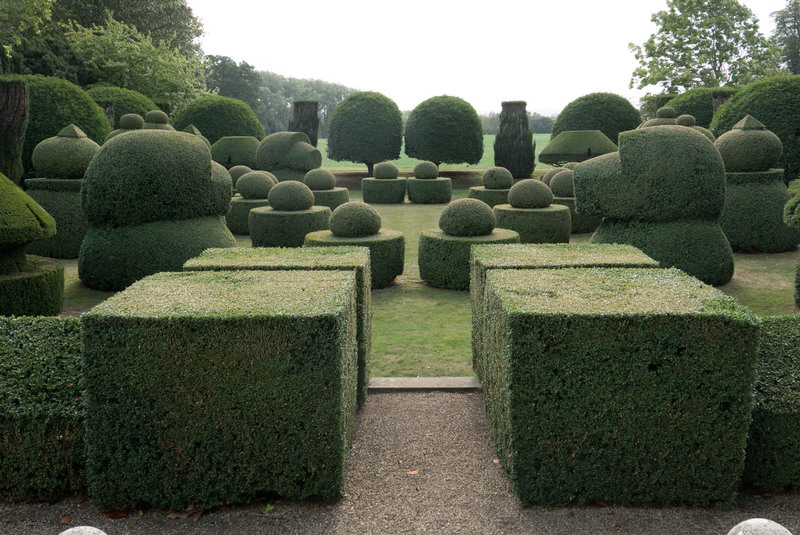 As gardens became more ‘natural’ and less formal, topiary went out of fashion. 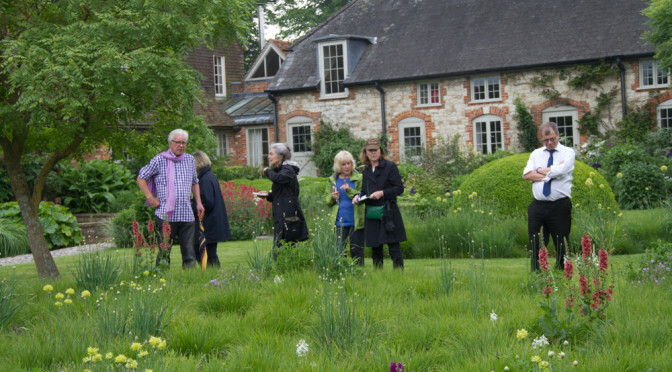 But the Arts and Crafts gardens of the early 20th century brought it back into style. 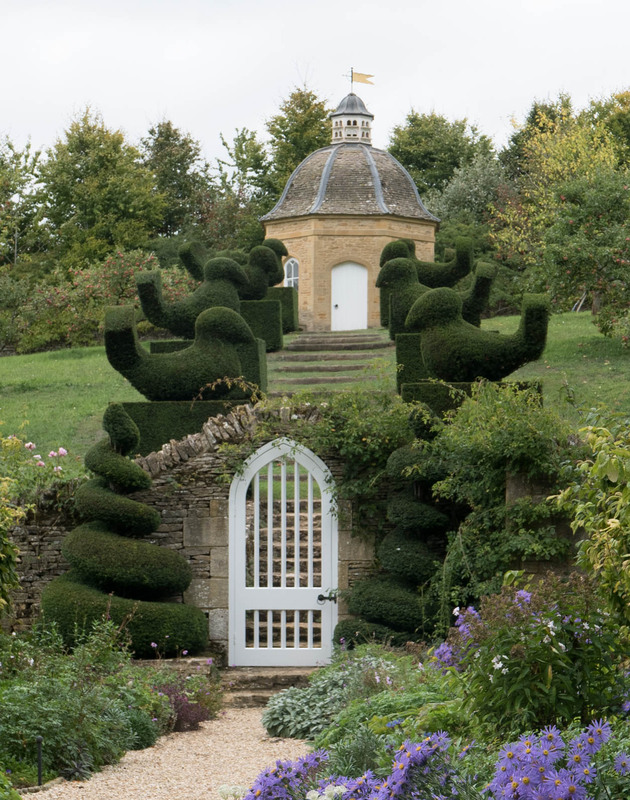 Lawrence Johnston used topiary to great effect in his garden, Hidcote, the first garden in England to be taken over by the National Trust. Contemporary topiary takes many forms. 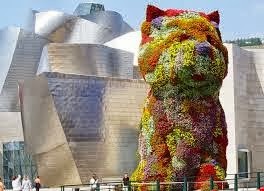 It is used extensively in American and European gardens to provide structure and a sense of formality. 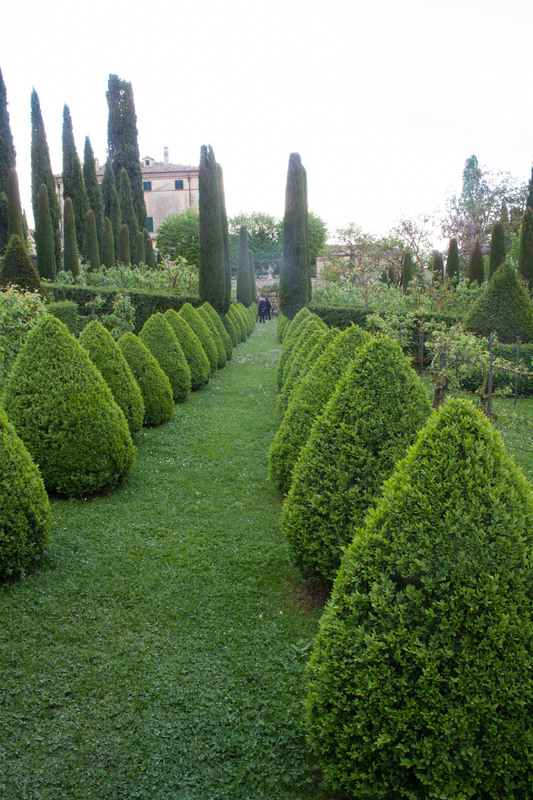 Well-clipped cones line a pathway at the Italian garden, Villa Cetinale. But it is used more imaginatively as well. 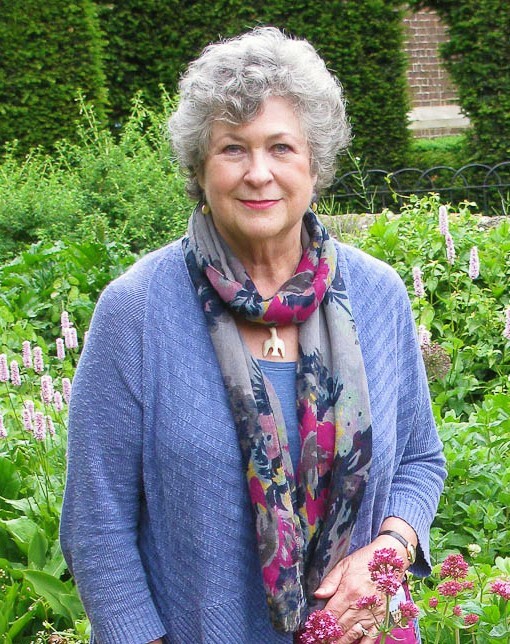 The American gardener Pearl Fryer has created elaborate shapes in his South Carolina garden. This wonderful Fryer ship sails across a dry lawn in the small town of Bishopville. Fryer’s creations have inspired his neighbours to try their hands, and many have succeeded wonderfully. Down the street from Fryer’s garden is this driveway, lined with delightful shrubs. 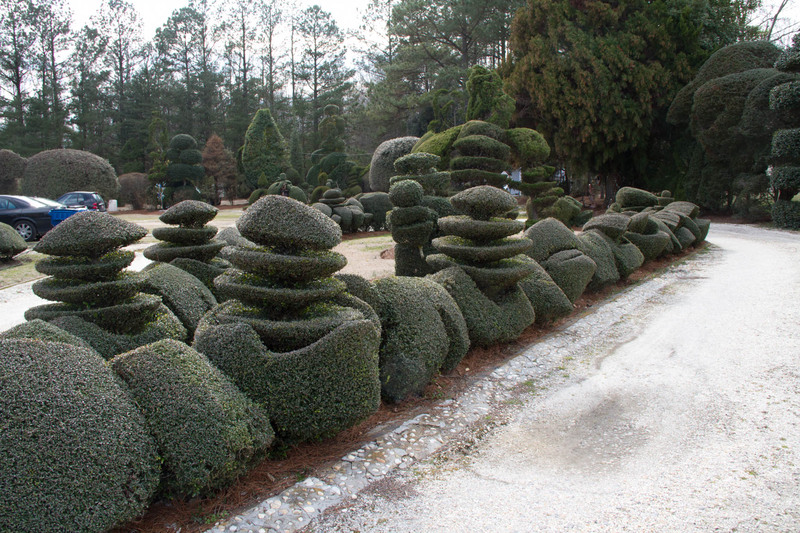 The plants used in topiary are evergreens, mostly woody ones with small leaves or needles. They have compact or columnar growth habits and dense foliage that allows them to be shaped into a variety of forms. Commonly used are boxwood (Buxus sempervirens), arborvitae (Thuja species), bay laurel (Laurus nobilis), holly (Ilex species), myrtle (Eugenia or Myrtus species), yew (Taxus species), and privet (Ligustrum species). I could grow many of these in my cold, Quebec garden and have often thought about where and how I might use topiary. But without taking advantage of the wire cages that are now available (which seem to me somehow like cheating), I doubt I have the patience or the steady hand to create a successful form. So for now, I’m content with the Christmas tree that hangs by the front door and another that stands outside on the deck, decorated with lights. What about you? Do you like topiary? 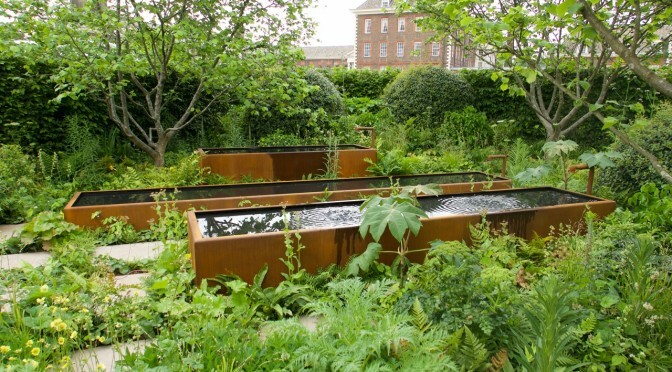 Does it feature in your garden or have you ever tried to create a geometric or representational form? Or like me in former days, do you think it is an abomination? Each bird is slightly different, and each has its own personality.